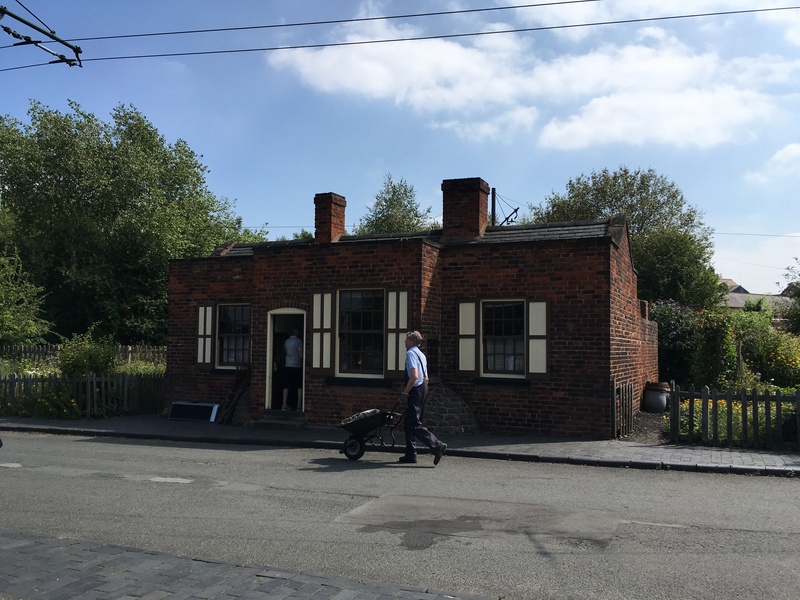 Have you come across the Black Country Living Museum in the West Midlands? It is an open air museum which brings to life the manufacturing and social history of the local area. It has been open to the public for over 30 years and more than 7 million visitors have walked around the “village” in that time. All the buildings have been painstakingly transferred, brick by brick, from their original locations in the local community, and have been rebuilt as accurately as possible within the museum, many including the original household contents and personal items that would have seen everyday life for so many years. One such building is the Toll House which used to be a couple of miles away in Sedgley. Inside, visitors are given an insight into life in the early 1900s, when Mrs Hodgkiss and her daughter Lilian called the compact Toll House their home. 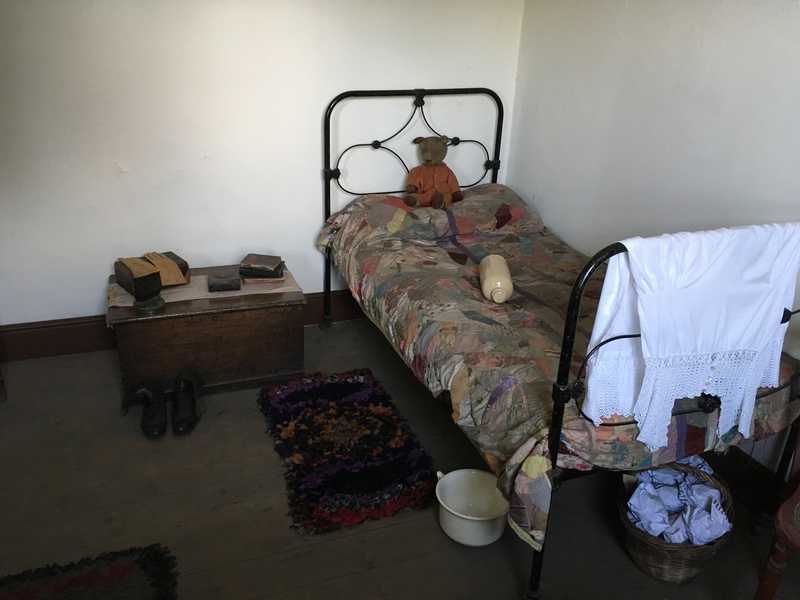 Apparently, Lilian herself visited the house when it was first relocated, advising museum staff on the position of furniture and decorations, and giving the recreated building her blessing. 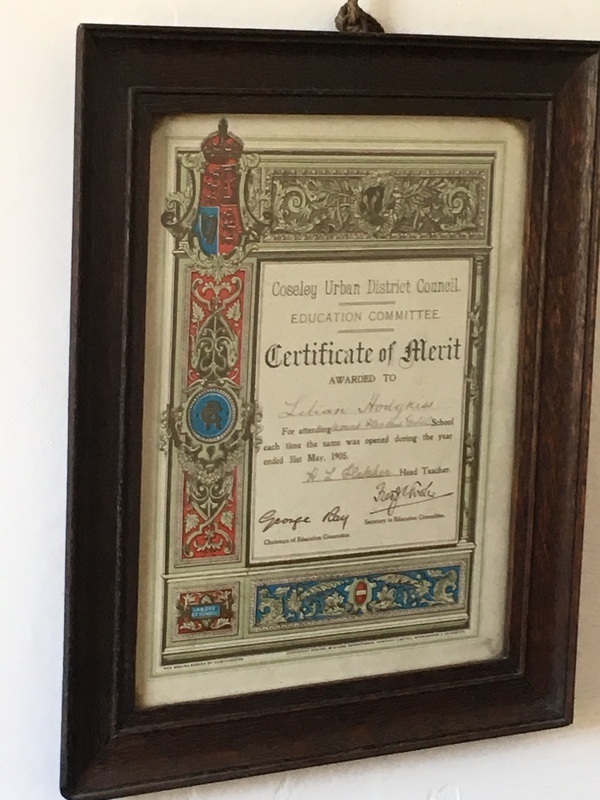 The certificate on the bedroom wall is the original document, celebrating Lilian’s 100% attendance at school in 1905. 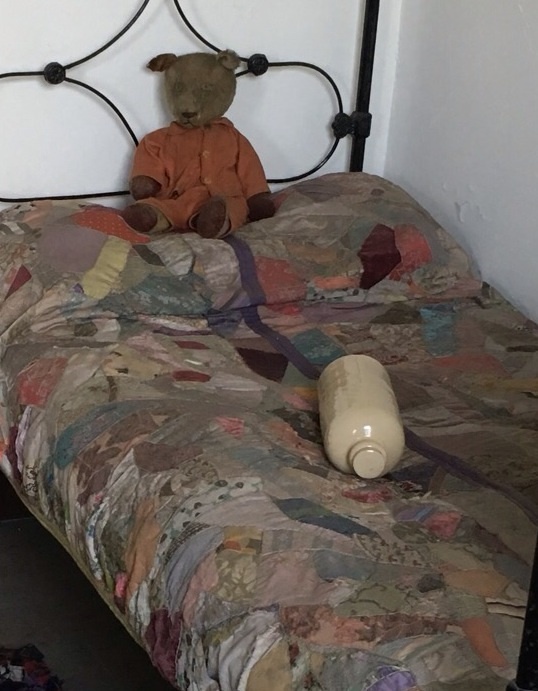 The teddy bear – well-loved and threadbare – was also Lilian’s, and now keeps watch over proceedings as visitors come and go. The hand-made quilt caught my eye … I commented to the museum assistant that they had done a good job of making something that fitted in so well with the feel and era of the whole exhibit … Yes, you’ve guessed it! It was Lilian’s original quilt, now faded and delicate, made for her over 100 years ago by her sister, using fabric oddments and hand-stitched with love. Imagine how cheerful and colourful it must have been all those years ago. A work of art, and an heirloom full of love and memories, now helping to share a sense of local history and providing inspiration to crafters for the creation of future heirloom pieces. Have you made or inherited a hand-crafted heirloom project? I’d love to hear about it! This entry was posted in Uncategorized and tagged craft, inspiration, museum. Bookmark the permalink. My Granny had hot water bottles like that one – they had to be wrapped in a towel, or they would burn you! Like going to bed with a teapot! The Museum has some wonderful things and put together very accurately. Must go again some time. Isn’t that just amazing?! I remember seeing that the last time we went a few years ago (2009?!). It also reminds me of the blankets folded up in the drawer under Granny’s bed which were given to her when she married in 1936 and may even be a generation older than that… saved “for best” and 80 years on looking like new because never used! Everything used to be used until it was threadbare or no longer patchable and so the occasion never arose to use the new blankets, goodness knows how old the ones are that are still on the beds?! 😮 Although I don’t know of any quilts in the family, there was plenty of thrift – when duvets came in in the 70s, Granny sewed her tatty old sleeping bags into covers made of sheets, to be used in the Nordic manner :).